Continuing his magisterial account of the Eastern Front campaigns, the writer cited by The Atlantic as ""indisputably the West's foremost expert on the subject"" focuses here on the Red Army's operations from the fall of 1943 through the April 1944. David M. Glantz chronicles the Soviet Army's efforts to further exploit their post-Kursk gains and accelerate a counteroffensive that would eventually take them all the way to Berlin. The Red Army's Operation Bagration that liberated Belorussia in June 1944 sits like a colossus in the annals of World War II history. What is little noted in the history books, however, is that the Bagration offensive was not the Soviets' first attempt. 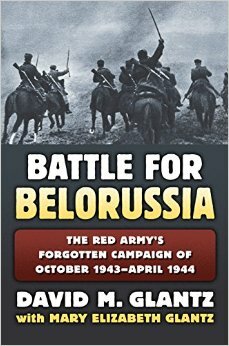 Battle for Belorussia tells the story of how, eight months earlier, and acting under the direction of Stalin and his Stavka, three Red Army fronts conducted multiple simultaneous and successive operations along a nearly 400-mile front in an effort to liberate Belorussia and capture Minsk, its capital city. The campaign, with over 700,000 casualties, was a Red Army failure. Glantz describes in detail the series of offensives, with their markedly different and ultimately disappointing results, that, contrary to later accounts, effectively shifted Stalin's focus to the Ukraine as a more manageable theater of military operations. Restoring the first Belorussian offensive to its place in history, this work also reveals for the first time what the later, successful Bagration operation owed to its forgotten precursor.